We specialize in designing and building affordable animatronic people, birds, animals, fortune teller machines, dinosaurs, and more. Let’s talk about the endless possibilities we can do for you. Since 1987, Characters Unlimited Inc. has specialized in “Making your place an attraction” by designing and building affordable, life-sized, animated and talking characters. We have hundreds of characters available for you to choose from, including animatronic people, birds, animals, dinosaurs, fortune telling machines, sign waivers, and much more. 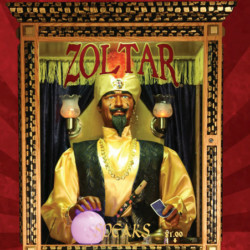 We are the only manufacture of the fortune teller Zoltar Speaks®. We take pride in creating a quality and reliable product for you to enjoy for years to come. All of our products include a one-year warranty. We have dozens of customers who have purchased our products 20+ years ago and still use them in their place to this day. All of our products are proudly built to order and handcrafted in the U.S.A. by a team of hardworking artists. "We had used a real moose trophy in some ads for years and bought one of your animated animals at the NADA show in Las Vegas. Since then we have used him in our shoots and had a contest to name him. Caboose was the winner. He always is happy go greet people coming in from our service drive. Every year we have a new “moose” themed giveaway for parades and we even use him in our radio commercials. Caboose has really helped brand our dealership image and make us stand out from the crowd." "We would like to say “Thank You” for turning us on to your characters. Over the past 4 years we have purchased three characters from you who are placed outside each of our three locations. Not only have they helped increase our traffic flow into our stores but they have become staples in the areas where our stores are located. Customers come back year after year and comment on how much they enjoy our characters and stores. We would not consider opening another store without purchasing a character for it." "I love your characters. I’ve seen one on several occasions. Being the sucker for animatronics that I am; I couldn’t believe how reasonable your pricing is. The animated bands are a great idea. These are the types of characters that common folk need to get and operate. Pneumatics and hydraulics are too high tech and high maintenance for most businesses who buy them and they wind up getting out of repair and in bad shape. These characters are something anybody could learn to care for and keep up." Check out our characters relevant to the upcoming season. Order soon to get them in time for your display!